I am a big fan of Pride and Prejudice and Zombies by Jane Austen and Seth Grahame-Smith. I thought the literary mash-up of Austen and zombies worked "very well in the context of the original Pride and Prejudice story because in Austen World the hunt for a husband is life and death, much like encounters with zombies." In Pride and Prejudice and Zombies, the Bennet daughters had pledged to fight zombies until they were "dead, lame, or married." Marriage is pretty much the end for the Bennets in whatever universe they're part of. And the book is funny. I didn't run out to read other classic/horror mash-ups because I thought it was a situation that would get old fast. Little Women and Werewolves by Louisa May Alcott and Porter Grand jumped out at me at a library book sale, though, and now I have, indeed, read it. The situation isn't old in this book. It just doesn't work the way it did with Pride and Prejudice. Little Women and Werewolves follows the original book very closely, but with werewolves slipped in. Instead of fighting the werewolves, the way the Bennets fight zombies, the Marches are far more passive, being merely sympathetic to the werewolves' plight, seeing as they have to live in hiding or they'll be hunted down by members of the bullyish Brigade. The March girls have learned from their minister father to be tolerant of werewolves. But here's the thing: The werewolves are cold-blooded killers. When the moon is full, they kill and eat innocents. They feel no remorse. The Marches have no problem with this. They are not horrified. That doesn't seem to make sense logically in the context of this story about these sensitive, gentle, spiritual people. I wondered if some of the gory scenes were supposed to be funny, but if so, I totally missed the humor. 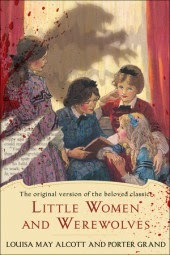 Little Women wasn't my favorite Alcott book when I was young. (I am a Little Men fan.) As I was reading Little Women and Werewolves, I started wondering what the original book's attraction is. There isn't a lot of story here. Even with werewolves. I may try to reread bits and pieces of it to compare them to the werewolf version.